A mosque is a place of worship for followers of the Islamic faith. Muslims often refer to the mosque by its Arabic name, masjid (pl. masajid) (Arabic: مسجد — pronounced: /ˈmas.ʤid/ or /ˈmas.ˈɡʲid/). The word "mosque" in English refers to all types of buildings dedicated for Islamic worship, although there is a distinction in Arabic between the smaller, privately owned mosque and the larger, "collective" mosque (masjid jami) ( Arabic: جامع), which has more community and social amenities. The primary purpose of the mosque is to serve as a place where Muslims can come together for prayer. Nevertheless, mosques are known around the world nowadays for their general importance to the Muslim community as well as their demonstration of Islamic architecture. They have developed significantly from the open-air spaces that were the Quba Mosque and Masjid al-Nabawi in the seventh century. 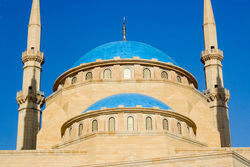 Today, most mosques have elaborate domes, minarets, and prayer halls. Mosques originated on the Arabian Peninsula, but now exist on all the world's inhabited continents. They are not only places for worship and prayer, but also places to learn about Islam and meet fellow believers. The Arabic word masjid means place of worship and is a noun of place from the verb sajada (root "s-j-d," meaning "to bow" or "to kneel") in reference to the prostrations performed during Islamic prayers. Either the word masjid itself or at least the verb from which it is derived was borrowed from Aramaic. The word "m-s-g-d" is attested in Aramaic as early as the 5th century BCE, and the same word is later found in Nabataean inscriptions with the meaning "place of worship"; apparently, this Aramaic word originally meant " stele" or "sacred pillar". The modern-day English word "mosque", just like its equivalents in many other European languages, derives from the word masjid via Spanish mezquita. The pre-cursors of the word "mosque" appeared during the 15th, 16th, and 17th centuries and "Moseak", "muskey", "moschy", and "mos'keh" were just some of the variations that came into use until it was decided that "mosquee", imitating Middle French, Italian, and Old Spanish, would become the standard. In the early 18th century, the modern spelling became the most popular and standard spelling of the word. The word "masjid" is found throughout the Qur'an, most frequently with the reference to the sanctuary of Kaaba in the city of Mecca. 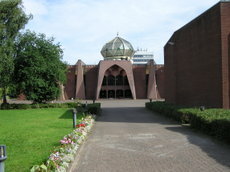 The Qur'an applies the term "masjid" to places of worship of different religions, including Judaism and Christianity; in the same general meaning of a place of worship, the word is used in the hadith, collections of Muslim traditions about the deeds and saying of their prophet Muhammad and his companions. Grand entryways and tall towers, or minarets, have long been and continue to be closely associated with mosques. However, the first three mosques were very simple open spaces on the Arabian Peninsula. Mosques evolved significantly over the next 1,000 years, acquiring their now-distinctive features and adapting to cultures around the world. According to Islamic beliefs, the first mosque in the world was the Kaaba, which was built by Abraham upon an order from God. The oldest Islamic-built mosque is the Quba Mosque in Medina. When Muhammad lived in Mecca, he viewed Kaaba as his first and principal mosque and performed prayers there together with his followers. Even during times when the pagan Arabs performed their rituals inside the Kaaba, Muhammad always held the Kaaba in very high esteem. The Meccan tribe of Quraish, which was responsible for guarding Kaaba, attempted to exclude Muhammad's followers from the sanctuary, which became a subject of Muslim complaints recorded in the Qur'an. When Muhammad conquered Mecca in 630, he converted Kaaba to a mosque, which has since become known as the Masjid al-Haram, or Sacred Mosque. The Masjid al-Haram was significantly expanded and improved in the early centuries of Islam in order to accommodate the increasing number of Muslims who either lived in the area or made the annual Hajj, or pilgrimage, to Mecca, before it acquired its present shape in 1577 in the reign of the Ottoman sultan Selim II. The first thing Muhammad did upon arriving with his followers near Medina (then named Yathrib) after the emigration from Mecca in 622 was build the Quba Mosque in a village outside Medina. Muslims believe he stayed at the Quba Mosque for three days before moving on to Medina. 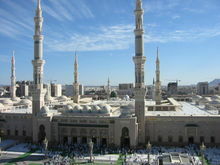 Just days after beginning work on the Quba Mosque, Muhammad went on to establish another mosque in Medina, known today as the Masjid al-Nabawi, or the Prophet's Mosque. The location of the mosque was declared as such after it hosted Muhammad's first Friday prayer. Following its establishment, the Masjid al-Nabawi continued to introduce some of the practices now considered common in today's mosques. For example, the adhan, or call to prayer, was developed in the form still used in mosques today. The Masjid al-Nabawi was built with a large courtyard, a motif common among mosques built since then. Muhammad would stand up at one end of the arcade to preach. Later on, he would develop a three-step pulpit as a platform from which he would give sermons. The pulpit, now known as a minbar, is still a common feature of mosques. Muhammad lived beside the mosque in Medina, which doubled as both a religious and political centre for the early Muslim community. Negotiations were conducted, military actions planned, prisoners of war held, disputes settled, religious information disseminated, gifts received and distributed among his companions. His followers treated the wounded there and some people even lived in the mosque permanently in tents and huts. Today, the Masjid al-Haram in Mecca, the Masjid al-Nabawi in Medina and Al Aqsa in Jerusalem are considered the three holiest sites in Islam. Mosques were built outside the Arabian Peninsula as Muslims moved to other parts of the world. Egypt became occupied by Muslim Arabs as early as 640, and since then so many mosques have appeared throughout the country that its capital city, Cairo, has acquired the nickname of city of a thousand minarets. Egyptian mosques vary in amenities, as some have Islamic schools ( madrassas) while others have hospitals or tombs. Mosques in Sicily and Spain do not reflect the architecture of Visigoth predecessors, but instead reflect the architecture introduced by the Muslim Moors. 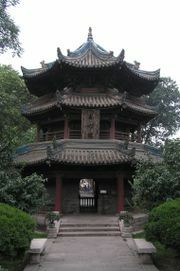 The first Chinese mosque was established in the eighth century in Xi'an. The Great Mosque of Xi'an, whose current building dates from the eighteenth century, does not replicate many of the features often associated with traditional mosques. Instead, it follows traditional Chinese architecture. Mosques in western China incorporate more of the elements seen in mosques in other parts of the world. Western Chinese mosques were more likely to incorporate minarets and domes while eastern Chinese mosques were more likely to look like pagodas. Mosques diffused into India during the reign of the Mughal empire in the sixteenth and seventeenth centuries. The Mughals brought their own form of architecture that included pointed, onion-shaped domes, as seen in Delhi's Jama Masjid. Mosques first arrived in the Ottoman Empire (mostly present-day Turkey) during the eleventh century, when many of the Turks in the region began to convert to Islam. 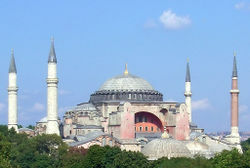 Several of the first mosques in the Ottoman Empire, such as the Hagia Sophia in present-day Istanbul, were originally churches or cathedrals in the Byzantine Empire. The Ottomans created their own design of mosques, which included large central domes, multiple minarets, and open façades. The Ottoman style of mosques usually included elaborate columns, aisles, and high ceilings in the interior, while incorporating traditional elements, such as the mihrab. Today, Turkey is still home to many mosques that display this Ottoman style of architecture. Mosques gradually diffused to different parts of Europe, but the most rapid growth in the number of mosques has occurred within the past century as more Muslims have migrated to the continent. Major European cities, such as Rome, London, and Munich, are home to mosques that feature traditional domes and minarets. These large mosques in urban centers are supposed to serve as community and social centers for a large group of Muslims that occupy the region. However, one can still find smaller mosques in more suburban and rural regions throughout Europe where Muslims populate. Mosques first appeared in the United States in the early twentieth century, the first of which was built in the late 1920s in Cedar Rapids, Iowa. However, as more immigrants continue to arrive in the country, especially from South Asia, the number of American mosques is increasing faster than ever before. Whereas only two percent of the country's mosques appeared in the United States before 1950, eighty-seven percent of American mosques were founded after 1970 and fifty percent of American mosques founded after 1980. Hagia Sophia, an Eastern Orthodox church converted into a mosque on the day of the Fall of Constantinople. Now it is a museum. Conversion of non-Muslim houses of worship into mosques began during the life of Muhammad, who turned the pagan sanctuary of Kaaba into a mosque, and continued during subsequent Islamic conquests and under the Muslim rule. As a result, numerous churches, synagogues, Zoroastrian and Hindu temples became Muslim places of worship. According to Islamic law, non-Muslims should not continue to use their places of worship for their intended purposes if they are conquered by Muslims and if there exists no treaty of surrender that explicitly mentions the right of non-Muslims to continue to use their places of worship. According to early Muslim historians, towns that surrendered without resistance and made treaties with the Muslims received permission to retain their churches and synagogues, while in towns taken by conquest, Jewish and Christian places of worship were seized by the Muslims. 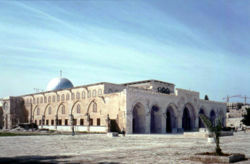 Al-Aqsa Mosque (pictured) was built on the Temple Mount, the holiest site in Judaism. 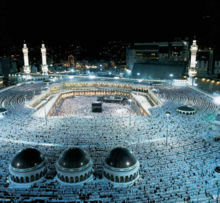 It is the third holiest mosque in Islam. One of the earliest examples of these kinds of conversions was in Damascus, Syria, where in 705 Umayyad caliph Abd al-Malik took the church of St. John from the Christians and had it rebuilt as a mosque, which is now known as Umayyad Mosque; overall, Abd al-Malik is said to have transformed 10 churches in Damascus into mosques. The process of turning churches into mosques was especially intensive in the villages, with the gradual conversion of the people to Islam. During his persecution of the Copts, Abbasid caliph al-Ma'mun turned many churches into mosques, both in Cairo and in Egyptian villages, which had no mosques in the earlier generations of Islam. Ottoman Turks converted into mosques nearly all churches, monasteries, and chapels in Constantinople, including the famous St. Sophia cathedral, immediately after capturing the city in 1453. In some instances mosques have been established on the places of Jewish or Christian sanctuaries associated with Biblical personalities who were also recognized by Islam. For example, Al-Aqsa Mosque and the Dome of the Rock are built on the Temple Mount, the most sacred site in Judaism. 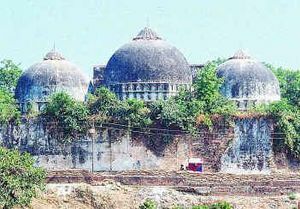 Muslim rulers and war commanders in India destroyed many Hindu temples and built mosques in their stead, seeing their actions as fulfillment of religious duty of asserting Islamic superiority. The same fate awaited many Zoroastrian temples after the Islamic conquest of Persia. On the other hand, mosques have also been converted for use by other religions, notably in southern Spain, following the conquest of the Moors in 1492. The Iberian Peninsula, Southeast Europe, and India are other regions in the world where such instances occurred once no longer under Muslim rule. All adult Muslims are required to offer prayer, or salah, at least five times each day. Although some smaller mosques with smaller congregations will offer only a few prayers, most mosques offer all five required prayers daily: before sunrise ( fajr), at midday ( dhuhr), in the afternoon ( asr), after sunset ( maghrib), and in the evening ( isha'a). Muslims are not required to offer prayer inside a mosque, but according to hadith, offering prayer in congregation at a mosque is considered more virtuous than offering prayer alone. In addition to holding the five obligatory daily prayers, mosques hold jumuah prayers, or Friday prayers, which replace the midday prayer as the second required prayer on Fridays. While the ordinary daily prayers can be performed at any location, it is required that all adult men attend Friday prayers at the mosque. A funeral prayer, or salat ul-janazah, is held for a deceased Muslim at the mosque, with all congregants present, including the imam, participating. Unlike with the daily prayers, the funeral prayers are normally held outdoors in a courtyard or square close to the mosque. During solar eclipses, mosques will host another special prayer called salat ul-kusuf. There are two large holidays, or eids, in the Islamic calendar: Eid ul-Fitr and Eid ul-Adha. On both of these days, there are special prayers held at mosques in the morning. 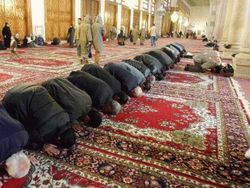 The eid prayers are supposed to be offered in large groups, and so larger mosques will normally host eid prayers for their congregants as well as the congregants of smaller local mosques. Some mosques will even rent convention centers or other large public buildings to hold the large number of Muslims who attend the eid prayers. Mosques, especially those in countries where Muslims are the majority, will also host eid prayers outside in courtyards or town squares. Islam's holiest month, Ramadan, is observed through many events. As Muslims must fast during the day during Ramadan, mosques will host iftar (break-fast) dinners after sunset and the fourth required prayer of the day, maghrib. Food is provided, at least in part, by members of the community, thereby creating nightly potluck dinners. Because of the community contribution necessary to serve iftar dinners, mosques with smaller congregations may not be able to host the iftar dinners daily. Some mosques will also hold suhoor meals before dawn to congregants attending the first required prayer of the day, fajr. As with iftar dinners, congregants usually provide the food for suhoor, although able mosques may provide food instead. Mosques will often invite poorer members of the Muslim community to share in beginning and breaking the fasts as providing charity during Ramadan in Islam is especially honorable. Following the fifth and final required prayer of the day, isha, special, optional tarawih prayers are offered in larger Sunni mosques. Shi'a mosques, however, do not observe tarawih prayers. During each night of prayers, which can last for up to two hours each night, a member of the community who has memorized the entire Qur’an will recite a segment of the book. During the last ten days of Ramadan, larger mosques will host all-night programs to observe Laylat al-Qadr, the night Muslims believe the Islamic prophet Muhammad first began to receive the Qur'an. On that night, between sunset and sunrise, mosques will employ speakers to educate congregants in attendance about Islam. Mosques or the community usually provide meals periodically throughout the night. During the last ten days of Ramadan, larger mosques within the Muslim community will host i'tikaf, a practice in which at least one Muslim man from the community must participate. Muslims performing i'tikaf are required to stay within the mosque for ten consecutive days, often in worship or learning about Islam. As a result, the rest of the Muslim community is responsible for providing the participants with food, drinks, and whatever else they need during their stay. The third of the Five Pillars of Islam states that Muslims are required to give approximately one-fortieth of their wealth to charity as zakat. Since mosques form the centre of Muslim communities, they are where Muslims go to both give zakat and, if necessary, collect zakat. Prior to the holiday of Eid ul-Fitr, mosques also collect a special zakat that is supposed to assist in helping poor Muslims attend the prayers and celebrations associated with the holiday. Many Muslim rulers after the death of the Islamic prophet Muhammad, emulating him, established their domains by first building a mosque. In the same way Mecca and Medina are built around the Masjid al-Haram and the Masjid al-Nabawi, Karbala, in present-day Iraq, was built around the Shi'ite Imam Hussain Shrine. 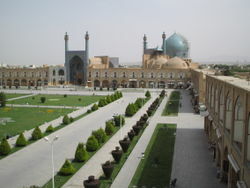 Isfahan, Iran is especially notable for its use of mosques to form the centre of the city. In the eighth century, a mosque was established within the city which three centuries later was described by theologian and philosopher Naser Khosrow as "a magnificent Friday Mosque built in the city centre." At the dawn of the seventeenth century, Shah Abbas I of the Safavid Dynasty led an effort to establish Isfahan as one of the largest and most beautiful cities in the world. As part of his plan, he ordered the building of Shah Mosque and Sheikh Lotf Allah Mosque which border Isfahan's Naghsh-i Jahan Square, which, as one of the largest city squares in the world, hosted sports and trade. Mosques built more recently, especially in countries where Muslims are not the majority, tend to be away from the center of major cities. Nevertheless, even a mosque in a less densely populated area often influences Muslims to relocate their homes and businesses so they are close to the mosque. Thus, mosques form the focal points of Muslim communities, even if they do not form the centre of the entire community as a whole. In the United States, the growth in the number of mosques and congregants in suburbs is much greater than that in densely urban areas. Another primary function of a mosque is to house educational facilities. Some mosques, especially those in countries where state-funded Islamic schools are not present, will have full-time schools that teach both Islamic and general knowledge. These full-time schools normally have students in elementary school and middle school, although there are also a few full-time schools available to high school students. Most mosques will also have part-time schools, either on the weekends or in the evenings. Whereas full-time schools are meant for children who depend on the mosque to provide an Islamic education as well as a general education, weekend and nightly schools are meant to provide only Islamic education for students of all ages, young and old. Some mosques, however, will also provide general educational help to Muslim students as a way of bringing young Muslims closer to the mosque. The subjects at the Islamic evening and weekend classes vary. Qur'an reading and Arabic are commonly found at mosques that are located in countries where Arabic is not widely spoken. Classes for new Muslims about the basics of Islam are also common, especially in Europe and the United States, where it is the fastest-growing religion. Mosques will also go into more depth about Islam by providing congregants with classes on Islamic jurisprudence. Madrassas are also available for Muslims to study 'alim to become Islamic scholars or imams. However, as their primary purpose is not to serve as a place of worship or community centre, madrassas are normally separate from neighbourhood mosques. 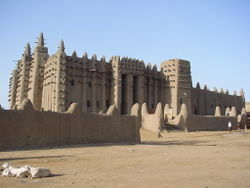 The Great Mosque of Djenné is host to an annual festival. Mosques will host events and dinners either for raising money for mosque activities or simply to bring the community together. Young people are often attracted to mosques that have sports facilities such as basketball courts or fields for soccer or American football. Courtyards at mosques are often used for hosting social gatherings; bazaars where community members can shop for Islamic merchandise are common among mosques. Mosques will also host weddings, much like other places of worship. One particularly interesting Illustration of this community involvement is that of the mosque in Djenné, Mali where, during an annual festival, the community takes part in the re-applying of plaster to the exterior of the mud brick building (the largest of its kind in the world). The late twentieth century saw an increase in the number of mosques used for political purposes. Today, civic participation is commonly promoted in mosques in the Western world, Because of the importance in the community, Masajid (Mosques) are used for preaching peaceful co-existence with other non-believers even in times of adversity. Countries where Muslims comprise only a minority of the population are more likely than the Muslim-majority countries of the Greater Middle East to use mosques as a way to promote civic participation. American mosques host voter registration and civic participation drives that promote involving Muslims, who are often first- or second-generation immigrants, in the political process. As a result of these efforts as well as attempts at mosques to keep Muslims informed about the issues facing the Muslim community, regular mosque attendants are more likely to participate in protests, sign petitions, and otherwise be involved in politics. Nevertheless, a link between political views and mosque attendance can still be seen in other parts of the world. A study done in May 1999 by an Israeli group Jerusalem Media and Communications Centre indicated that Palestinians are more likely to advocate suicide bombings and rebellions against Israeli occupation. Following the al-Askari Mosque bombing in February 2006, imams and other Islamic leaders used mosques and Friday prayers as vehicles to call for calm and peace in the midst of widespread violence. During the Jyllands-Posten Muhammad cartoons controversy in February 2006, leaders at mosques determined the reaction of their congregants. 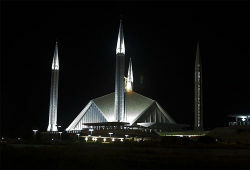 While some leaders in South Asia and the Middle East called for more violent reactions to cartoons irreverently depicting the Islamic prophet Muhammad, other leaders within the region and around the world called for more restrained anger; in both situations, the congregants of their respective mosques reacted accordingly. Beginning in the late twentieth century and continuing into the early twenty-first century, a small number of mosques have also become the platforms of some extremist imams to advocate terrorism and extreme Islamic ideals. Finsbury Park Mosque in London is exemplary of a mosque that has been used in this manner. The mosque has been linked to several convicted and suspected terrorists, including Zacarias Moussaoui, Richard Reid, and Abu Doha. The mosque's former imam, Abu Hamza al-Masri, preached support for al-Qaeda and its leader Osama bin Laden even after al-Masri was banned from preaching at the mosque in February 2003. At least two of the bombers in the 7 July 2005 London bombings also met at another mosque in London, the Stratford Street mosque. Similarly, Omar Abdel-Rahman, who often delivered sermons at New York City area mosques, was convicted of masterminding the 1993 World Trade Centre bombing. As they are considered important to the Muslim community, mosques are often at the heart of social conflicts. Today, social conflicts conducted through mosques are especially noticeable in Iraq, which is highly populated with both Sunni and Shi'ite Muslims. Violence between the two branches of Muslims has led to a number of mosque bombings. A February 2006 bombing that seriously damaged Iraq's al-Askari Mosque, a holy Shi'a mosque, exacerbated tensions that had already existed between Sunni and Shi'ite Muslims. Other mosque bombings in Iraq, both before and after the February 2006 bombing, have been part of the conflict between the country's groups of Muslims. However, mosque bombings have not been exclusive to Iraq; in June 2005, a suicide bomber killed at least 19 people at an Afghan mosque. In April 2006, two explosions occurred at India's Jama Masjid. Regardless, the clear divide between Sunni and Shi'ite Muslims as well as the War in Iraq have made the mosque attacks in Iraq the most visible. Some mosques have also been targeted by hate crimes initiated by non-Muslims. Following the September 11 attacks, several American mosques were targeted in attacks ranging from simple vandalism to arson. Furthermore, the Jewish Defense League was suspected of plotting to bomb the King Fahd Mosque in Culver City, California. Similar attacks occurred throughout the United Kingdom following the 7 July 2005 London bombings. Outside the Western world, in June 2001, the Hassan Bek Mosque was the target of attacks involving hundreds of Israelis angry at Arabs for a previous attack. The proliferation of mosques has also caused concerns with some European residents who feel intimidated by the presence of Muslims in mostly white and Christian neighborhoods. Although the Saudi involvement in mosques around the world can be traced back to the 1960s, it was not until later in the twentieth century that the government of Saudi Arabia began to become a large influence in foreign mosques. Beginning in the 1980s, the Saudi Arabian government began to finance the construction of mosques in countries around the world. An estimated US$45 billion has been spent by the Saudi Arabian government financing mosques and Islamic schools in foreign countries. Ain al-Yaqeen, a Saudi newspaper, reported in 2002 that Saudi funds may have contributed to building as many as 1,500 mosques and 2,000 other Islamic centers in countries where Muslims are not the majority. Saudi citizens have also contributed significantly to mosques in the Islamic world, especially in countries where they see Muslims as poor and oppressed. Following the fall of the Soviet Union, in 1992, mosques in impoverished Afghanistan saw many contributions from Saudi citizens. The King Fahd Mosque in Culver City, California and the Islamic Cultural Centre of Italy in Rome represent two of Saudi Arabia's largest investments in foreign mosques as former Saudi king Fahd bin Abdul Aziz al-Saud contributed US$8 million and US$50 million to the two mosques, respectively. The majority of Muslims and the government in Saudi Arabia adhere to a form of Islam known as Wahhabism that promotes a strict adherence to Islamic law. As a result, many countries where funding from Saudi Arabia is going to Islamic centers believe Saudi Arabia is exporting extreme fundamentalist views. Since the September 11, 2001 attacks, countries have also paid more attention to Saudi funding as they fear part of the funding may be going to terrorist groups through foreign mosques. The general structure of mosques are a continuation of the pre-Islamic Sassanian architecture of Persia (Iran) as mentioned in the book "Persian architecture; the triumph of form and colour" by Arthur Upham Pope. After the introduction of Islam to Persia, this architecture was adopted to be used for mosques by what was to later become the Muslim World. Many forms of mosques have evolved in different regions of the Islamic world. Notable mosque types include the early Abbasid mosques, T-type mosques, and the central-dome mosques of Anatolia. The oil-wealth of the twentieth century drove a great deal of mosque construction using designs from leading non-Muslim modern architects and promoting the careers of important contemporary Muslim architects. Arab-plan or hypostyle mosques are the earliest type of mosques, pioneered under the Umayyad Dynasty. 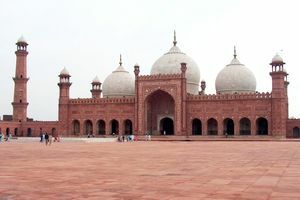 These mosques are a square or rectangular in plan with an enclosed courtyard and a covered prayer hall. Historically, in the warm Mediterranean and Middle Eastern climates, the courtyard served to accommodate the large number of worshippers during Friday prayers. Most early hypostyle mosques have flat roofs on top of prayer halls, which resulted in the need to use numerous columns and supports. 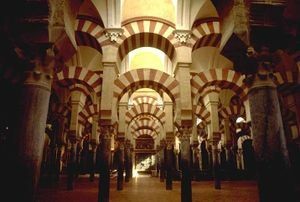 One of the most notable hypostyle mosques is the Mezquita in Córdoba, Spain, as the building is supported by over 850 columns. Frequently, hypostyle mosques have outer arcades so that visitors could enjoy some shade. Arab-plan mosques were constructed mostly under the Umayyad and Abbasid dynasties; subsequently, however, the simplicity of the Arab plan limited the opportunities for further development, and as a result, these mosques gradually fell out of popularity. 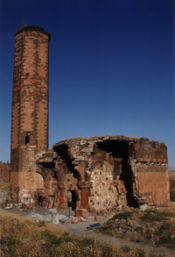 The ruins of Menüçehr Camii near Kars, Turkey, believed to be the oldest Seljuk mosque in Anatolia. The Ottomans introduced central dome mosques in the fifteenth century and have a large dome centered over the prayer hall. In addition to having one large dome at the center, a common feature are smaller domes that exist off-centre over the prayer hall or throughout the rest of the mosque, where prayer is not performed. This style was heavily influenced by the Byzantine religious architecture with its use of large central domes. A common feature in mosques is the minaret, the tall, slender tower that usually is situated at one of the corners of the mosque structure. The top of the minaret is always the highest point in mosques that have one, and often the highest point in the immediate area. The tallest minaret in the world is located at the Hassan II Mosque in Casablanca, Morocco. The first mosques had no minarets, and even nowadays the most conservative Islamic movements, like Wahhabis, avoid building minarets, seeing them as ostentatious and unnecessary. The first minaret was constructed in 665 in Basra during the reign of the Umayyad caliph Muawiyah I. Muawiyah encouraged the construction of minarets, as they were supposed to bring mosques on par with Christian churches with their bell towers. Consequently, mosque architects borrowed the shape of the bell tower for their minarets, which were used for essentially the same purpose — calling the faithful to prayer. Before the five required daily prayers, a muezzin calls the worshipers to prayer from the minaret. In many countries where Muslims are not the majority, mosques are prohibited from loudly broadcasting the call to prayer ( adhan), although it is supposed to be said loudly to the surrounding community. The adhan is not required before every prayer. However, nearly every mosque assigns a muezzin for each prayer to say the adhan as it is a recommended practice or sunnah of the Islamic prophet Muhammad. At mosques that do not have minarets, the adhan is called instead from inside the mosque or somewhere else on the ground. The iqama, which is similar to the adhan and said immediately before the start of prayer, is usually not said from the minaret even if a mosque has one. According to the book "Persian architecture; the triumph of form and colour" by Arthur Upham Pope, two important contributions to architecture by the pre-Islamic Parthian and Sassanian Persians were domes and arches. Domes have long been a hallmark of mosques and Islamic architecture in general since the seventh century. Moreover, it was in this century that Islam was introduced to Persia. The domes, which often are placed directly above the main prayer hall, may signify the vaults of heaven and the sky. As time progressed, the sizes of mosque domes grew, from occupying only a small part of the roof near the mihrab to encompassing all of the roof above the prayer hall. Although domes normally took on the shape of a hemisphere, the Mughals in India popularized onion-shaped domes in South Asia and Persia. Some mosques will have multiple, often smaller, domes in addition to the main large dome that resides at the centre. 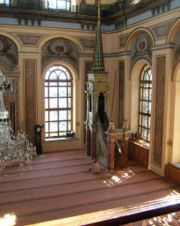 The prayer hall, also known as the musalla, has no furniture; chairs and pews are absent from the prayer hall so as to allow as many worshippers as possible to line the room. Prayer halls contain no images of people, animals, and spiritual figures as Muslims in prayer are supposed to only be focusing on Allah. Instead, mosques will have Arabic calligraphy and verses from the Qur'an on the walls to assist worshippers in focusing on the beauty of Islam and its holiest book, the Qur'an, as well as for decoration. Usually opposite the entrance to the prayer hall is the qibla wall, which is the visually emphasized area inside the prayer hall. The qibla wall should, in a properly oriented mosque, be set perpendicular to a line leading to Mecca, the location of the Ka'bah. Congregants pray in rows parallel to the qibla wall and thus arrange themselves so they face Mecca. In the qibla wall, usually at its centre, is the mihrab, a niche or depression indicating the qibla wall. Usually the mihrab is not occupied by furniture either. Sometimes, especially during Friday prayers, a raised minbar or pulpit is located to the side of the mihrab for a khatib or some other speaker to offer a sermon ( khutbah). The mihrab serves as the location where the imam leads the five daily prayers on a regular basis. As ritual purification precedes all prayers, mosques often have ablution fountains or other facilities for washing in their entryways or courtyards. However, worshippers at much smaller mosques often have to use restrooms to perform their ablutions. In traditional mosques, this function is often elaborated into a freestanding building in the centre of a courtyard. This desire for cleanliness extends to the prayer halls where shoes are disallowed to be worn anywhere other than the cloakroom. Thus, foyers with shelves to put shoes and racks to hold coats are commonplace among mosques. Mosques, in accordance with Islamic practices, institute a number of rules intended to keep Muslims focused on worshipping Allah. While there are several rules, such as those regarding allowing shoes in the prayer hall, that are universal, there are many other rules that are dealt with and enforced in a variety of ways from mosque to mosque. Appointment of a prayer leader is considered desirable, but not always obligatory.. The permanent prayer leader ( imam) must be a free honest man, who has learned the Qur'an by heart and is authoritative in religious matters. In mosques constructed and maintained by the government, the prayer leader is appointed by the ruler; in private mosques, however, the appointment is done by the members of the congregation through majority voting. According to the Hanafi school of Islamic jurisprudence, the man who built the mosque has a stronger claim to the title of imam, but this view is not shared by the other schools. Leadership at prayer falls into three categories, depending on the type of prayer: five daily prayers, Friday prayer, or optional prayers. According to the Hanafi and Maliki school of Islamic jurisprudence, appointment of a prayer leader for Friday service is mandatory because otherwise the prayer is invalid. The Shafi'i and Hanbali schools, however, argue that the appointment is not necessary and the prayer is valid as long as it is performed in a congregation. A slave may lead a Friday prayer, but Muslim authorities disagree over whether the job can be done by a minor. An imam appointed to lead Friday prayers may not also lead at the five daily prayers; however, Muslim scholars disagree as to whether the leader appointed for five daily services may lead the Friday service as well. All Muslim authorities hold the consensus opinion that women may not lead prayer. Recently, the rule was relaxed in some places in China, where women have been allowed to lead prayer in front of all-female congregations. There have been a few women, most notably Amina Wadud, who have defied the ruling and have opted to lead mixed-gender prayers and Friday prayers. All mosques have rules regarding cleanliness, as it is an essential part of the worshipper's experience. Muslims before prayer are required to cleanse themselves in an ablution process known as wudu. However, even to those who enter the prayer hall of a mosque without the intention of praying, there are still rules that apply. Shoes must not be worn inside the carpeted prayer hall. Some mosques will also extend that rule to include other parts of the facility even if those other locations are not devoted to prayer. Congregants and visitors to mosques are supposed to be clean themselves. It is also undesirable to come to the mosque after eating something smelly. Islam requires that its adherents wear clothes that portray modesty. As a result, although many mosques will not enforce violations, both men and women when attending a mosque must adhere to these guidelines. Men are supposed to come to the mosque wearing loose and clean clothes that don't reveal the shape of the body. Likewise, it is recommended that Muslim women wear loose clothing, shirts, and pants that cover to the wrists and ankles. Many mosques will require that non-Muslim female visitors also wear a scarf to cover the head in the style of the Islamic hijab. Middle eastern clothing often associated with Islam is not necessary, although many Muslims, regardless of their ethnic background, will wear them to special occasions and prayers at mosques. As mosques are places of worship, those within the mosque are required to remain respectful to those in prayer. Loud talking within the mosque, as well as discussion of topics deemed disrespectful, is forbidden in areas where people are praying. In addition, it is disrespectful to walk in front of or otherwise disturb Muslims in prayer. The walls within the mosque have few items, except for possibly Arabic calligraphy, so Muslims in prayer are not distracted. Muslims are also discouraged from wearing clothing with distracting images and symbols so as not to divert the attention of those standing behind them during prayer. Islamic law requires men and women to be separated in the prayer hall; ideally, the women must occupy the rows behind the men. Muhammad preferred women to pray at home rather than at a mosque, and according to the hadith Muhammad said: "The best mosques for women are the inner parts of their houses." The second caliph Umar went so far as to prohibit women from attending mosques and required them to pray at home. Sometimes a special part of the mosque was railed off for women; for example, the governor of Mecca in 870 had ropes tied between the columns to make a separate place for women. Many mosques today will put the women behind a barrier or partition or in another room. Mosques in South and Southeast Asia put men and women in separate rooms, as the divisions were built into them centuries ago. In nearly two-thirds of American mosques, women pray behind partitions or in separate areas, not in the main prayer hall; some mosques do not admit women at all. Almost a quarter of the mosques do not offer programs for women, and a third do not allow women on governing boards. The large crowds present at the Masjid al-Haram in Mecca, especially during the annual pilgrimage, often result in unintended mixing between genders. Some Islamic jurists would prefer to exclude women from prayer halls altogether. Women are subjected to other restrictions in mosques. According to some hadith, they must not be perfumed; according to others, they must leave the mosque before the men. The Hassan II Mosque in Casablanca is one of two mosques in Morocco open to non-Muslims. 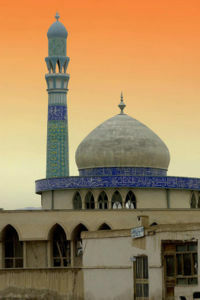 Under most interpretations of Islamic law, non-Muslims may be allowed into mosques, as long as they do not sleep or eat there; the dissenting opinion is presented by the followers of the Maliki school of Islamic jusrisprudence, who argue that non-Muslims may not be allowed into mosques under any circumstances. According to Ahmad ibn Hanbal, these verses were followed to the letter at the times of Muhammad, when Jews and Christians, considered monotheists, were still allowed to the Masjid al-Haram. However, the Umayyad caliph Umar II later forbade non-Muslims from entering mosques, and his ruling remained in practice in Saudi Arabia. Today, the decision on whether non-Muslims should be allowed to enter mosques varies. With few exceptions, mosques in the Arabian peninsula as well as Morocco do not allow entry to non-Muslims. 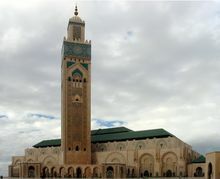 For example, the Hassan II Mosque in Casablanca and the Moulay Ismael Mosque in Meknes are the only two mosques in Morocco currently open to non-Muslims. However, there are also many other places in the west as well as the Islamic world where non-Muslims are welcome to enter mosques. Most mosques in the United States, for example, report receiving non-Muslim visitors every month. Many Mosques throughout the United States welcome non-Muslims as a sign of openness to the rest of the community as well as to encourage conversions to Islam. In modern-day Saudi Arabia, the Masjid al-Haram and all of Mecca are open only to Muslims. Likewise, the Masjid al-Nabawi and the city of Medina that surrounds it are also off-limits to those who do not practice Islam. For mosques in other areas, it has most commonly been taken that non-Muslims may only enter mosques if granted permission to do so by Muslims and if they have a legitimate reason. All entrants regardless of religious affiliation are expected to respect the rules and decorum for mosques. At different times and places, non-Muslims living under Muslim rule were required to demonstrate deference to mosques. In most cities of Morocco, Jews were required to remove their shoes when passing by a mosque Danish traveler Carsten Niebuhr wrote that in 18th-century Egypt Jews and Christians had to dismount before several mosques in veneration of their sanctity.